So its been a few months now and this boat has been and gone a few times. It is back on my mooring asof the other day and nobody knows who owns it. The landowner has it down as abandoned and has rent arrears of minimum three years. Licence in window three years out. 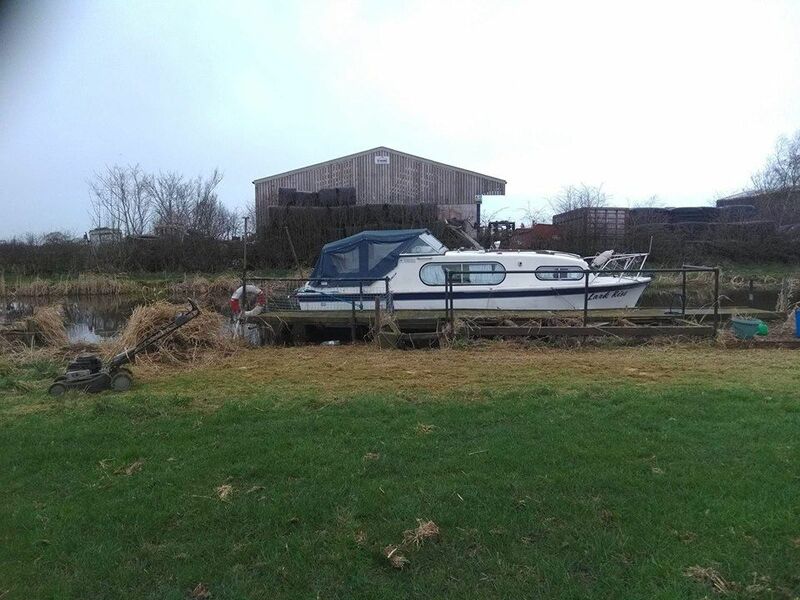 It has been seen moved from my mooring to the end of the line for a mechanic to work on and a chap spoke to him last week and the `owner` of the boat said that my mooring is his and was adamant on that. Landowner called the last contact and a rude chap said it wasnt his or new anything about it. Now all we know is nothing on who owns it or can catch the chap who is dealing with the mechanic, i will be trying to find this mechanic as and when. CRT have been notified but they dont rush as i believe it was tagged over a year ago by them a sit wasnt licenced either. It is moored at Cabus Nook on the Lancaster canal and itis called Lark Rise. So if anyone knows of it or the owner please tell then to get in touch. I have left a mooring sign of my boats name and my number for them on the mooring or can be contacted here..
Something strange here. The landowner is charging him rent (even if he isn't actually paying it)? What does the landowner say about whose mooring it is? Further south on the system, a boat owing rent would have been removed by the landowner a long time ago and deposited on the towpath for CRT to sort out. It was three years in arrears with rent when the mooring owner logged it as abandoned a sshe was etting no luck with contacting the owner. and same time roughly when it got tagged by CRT and then vanished for around 12 months. I got the mooring in January when in Feb it arrived back on my mooring. The mooring is mine as paid for. She says which i agree with as not to move it yet as they will likely move it back if my boat isnt there. I should be there by June. If your boat is on a mooring you are charged rent so the reason i guess for three years in arrears. The owner may of been a bit slow on catch up. Who knows. If they are actually arrears from a mooring agreement would that constitute grounds for a lien (financial claim) on the boat? If the boat has just been 'squatting' there for three years without any agreement then I don't know. How did the landowner have a number (even if incorrect) if there was no agreement in place between him and current or previous owner in the first place? I'm sure that I have seen this boat advertised for sale recently. If its there when i get there with no reply from them then i will no longer be the nice me and the wind will take far far away. Ask the transport guys if they do like some electrical stores and will take the old one away for scrap when they put yours in the water. In all seriousness though it looks like quite a smart example of a Freeman so the not giving a flying fig about licence or moorings seems to sit a little incongruously with the boat itself. Tried it lol. CRT said no we, as in me or the landowner cant. I am not sure how on the ball Lancaster inspectors are, but it seems not to much unless its been on dry land. Thinking i could call local boat yards/marinas if they have had it in. Hang on a minute, why the hell should i be doing any of that. Rather than getting involved in the bother and hassle with it,can you just move it along a few yards and tie it up with mooring pins? No worries thanks for looking. Yes i will be doing that if its still there when i get there. Just want to give the owner a chance that its needs moving. I think the mooring operator (not you though) could claim a lien on it, put a notice on it, then sell it after a time period. Of course....with it being 3 years in arrears.....this should have been started much time ago. Also they could just move it (but then unlikely to claim the lien). If its worth more than the lost mooring fees from its being in the way, then it would be worth doing the lien/notice/sell. I think the mooring operator (not you though) could claim a lien ﻿on it, put a notice on it, then sell it after a time period. Of course....with it being 3 years in arrears.....this should have been started much time ago. Also they could just move it (but then unlikely to claim the lien). If its worth more than the lost mooring fees from its being in the way, then it would be worth doing the lien/notice/sell. I will put it to her, although she does seem the not liking to get involved in this kid of thing person. I would buy it of her and make a few quid to clear her fees owed. I would buy it of her and make a few quid to clear her fees owed. They are rather nice boats. Shaft drive,but usually with a Ford petrol engine. Beam if memory serves is 7'-6" so ok for most canals. Freeman did make a narrow beam cruiser,(6'-10" with a weed hatch and extra rubbing strips) but they seem to be as rare as rocking horse droppings. I know this because I looked for one before I bought my present boat. only of it was done correctly i would. but then i have recovered boats in the past that way. However I can't see its index from your photograph so not certain. If it is licensed and insured and has a BSS certificate but moored illegally I dare say C&RT will not do anything . The boat pictured is a Freeman 23 which matches CRT records for a boat of the same name. Think these were all 7'6"; I've never seen a narrow one. The earlier Freeman 22s came in 7'6" and 6'10"flavours and like you say the narrow ones seem to come up less frequently in fleabay auctions and summon greater interest from potential buyers. Is it currently licensed? W+T says CRT says no and I don't know how to check current status. A boat's name and number in their records doesn't mean it is currently registered and licensed. The name and licence number on a boat I use (that's been away from and not licensed for CRT's waters for the last 10 years) is still in the info available at CanalPlanAC. Also if someone has dropped it in and just got a short term licence that wouldn't flag with the checkers as a delinquent boat for a previous long-term licence if old number not showing. Is it currently licensed? W+T says CRT says no and I don't know how to check current status. I'd never seen CRT's boat checker before. Cheers. You learn something new every day. I'm not sure but is that a licence plate beneath the windscreen sides? Can't make out the index number if it is. It probably is the same boat as there's only one Freeman called Lark Rise on the listing. I was about to say i ddint notice one today as its the first time i have seen it up close. and i was in a rush as skiving off work I hope to check it tomorrow.